When you look in your garage, what do you do see? My garage looks like a nightmare. I've got bikes, toys, yard tools, shovels and more stuff all over the place. Some days I would love to sweep it all to the curb for the trash man to take away. While my statement is in jest, I would like to have an organized garage that everything has a place. This holiday season I'm giving my family the gift of an organized garage with products from? My biggest garage nemesis are my kids bikes. It seems that they have banged my car, almost been hit by the garage door and basically flung on the ground time and time again. It shouldn't be so difficult to put them in a specific place. 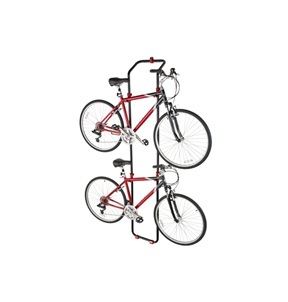 The Bike Rack by Racor allows me to conveniently store the bike on the wall and away from my car. With the ability to hold up to 100 pounds, this bike stand can grow with the kids as their bikes get bigger. Plus, the whole unit fits securely on the wall, which reduces clutter and increases the space in my garage. Overall, a win-win situation. The suggested retail price for the bike rack is $60. When it comes down to it, the garage is really my husband's domain. After all, playing with power tools and gadgets is more of a manly activity. While I understand the need to have lots of "toys," I would prefer to have everything in its place. 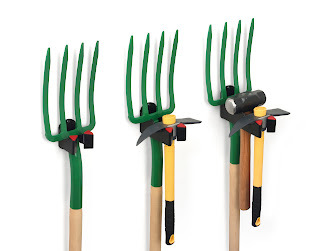 From snow shovels to hedge trimmers, I don't want these items around during the kids play time. That's why my husband is getting several Racor SecureHold. The Racor SecureHold is the solution to storing long-handled tools.Unlike a traditional hook, a long handled tool passed through the steel spring opening and sits in a deep V-groove to securely hold the item. The combination of spring and V-groove helps to prevent the tool from being accidentally knocked off the hook. Each hook can hold up to 65 pounds. There are three versions of the product, a single hook, double and triple. It retails between $6 and $12. With the SecureHold you don't have to worry that a heavy shovel or tree trimmer will fall on your child when he gets his basketball. With the garage storage solutions from Racor there is no reason to have an unorganized garage. It is time to reclaim your garage with products from Racor. Disclosure: I received this products to review. All opinions are my own. Our garage is a hot mess. We moved in a year ago and it has NEVER been close to being organized. Checking out Racor now! Our garage is awful. I need to get more organized! I need to organize our garage so bad. We use it as a storage but don't organize. Though I don't have a garage, I do have a basement and it could definitely use some organization! The thought of an organized garage makes me swoon! Someday I hope to have everything in its place and organized properly.